April 3, 1902 -- La Salle Street ... Best Means of Connecting the Windy City? April 3, 1902 – The Chicago Daily Tribune reports on “a group of business-men who drive to their offices from their North Side residences”. [Chicago Daily Tribune, April 3, 1902] In an informal discussion the men generally agree that La Salle Street is the best means of connecting the Loop with the portion of the city north of the river. One participant says, “The route is the most central. It will require the least attention, and it passes through one of the best districts between the heart of the city and Lincoln Park.” To make the connection a reality would require about $200,000, the men estimate, a sum that would pay for “about a mile” of asphalt paving, a bascule bridge over the river and lowering of the cable car tracks at Illinois Street. An attorney on the Lincoln Park board says of the plan, ‘Legally, there would be little trouble with the plan. It seems to me to be a good plan, event though it might be merely temporary. The name sounds well, for Chicago and the Northwest owe much to La Salle. They have given him far too little credit.” The opinion of the men is borne out, in part, as in 1927 work begins on widening of La Salle Street north of the river. Seven years before that, though the Michigan Avenue bridge is completed, making Michigan Avenue the principle north-south street leading across the river. 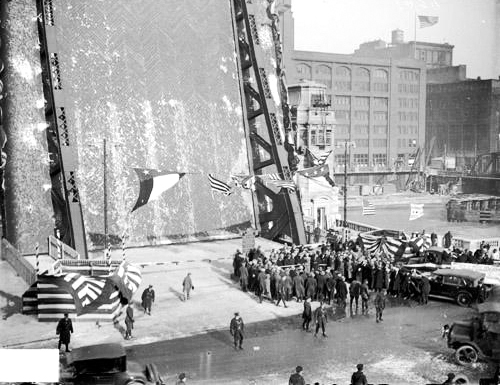 The photo shows opening ceremonies for the new La Salle Street bridge in 1929. 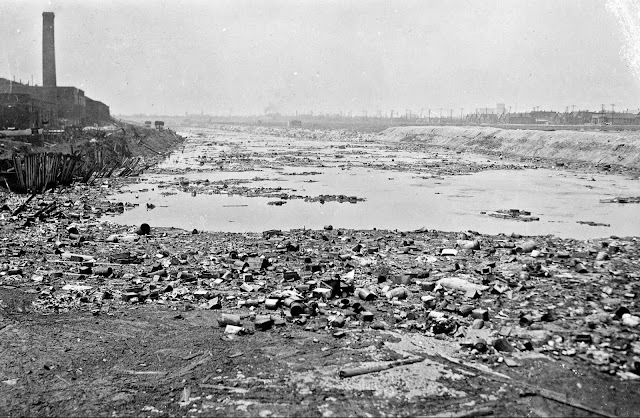 April 3, 1911 – The Engineering Committee of the Sanitary Board passes an injunction against 16 firms in the Union Stockyards, seeking to restrain the companies from dumping refuse into Bubbly Creek, the south fork of the South Branch of the Chicago River running along the edge of the stockyards. The members of the committee accuse the firms of “damaging the main channel of the Chicago river and endangering the health and lives of the public.” [Chicago Daily Tribune, April 4, 1911] The firms are ordered to appear before the committee on April 10 and “show cause why proceedings should not be brought against them.” The packers did show up and “agreed to appoint a committee to investigate the condition and suggest action.” A week later the two sides come together again with the stockyards representatives reporting they have taken no action. The chairman of the engineering committee, Wallace G. Clark, reaches the end of his patience, stating, “It is my opinion that your firms can be indicted, and that we can have injunctions issued against you to stop this pollution and unless there is immediate action on your part we intend to act.” Three months pass before the packers agree to authorize the expenditure of $28,000 to clean up the festering ditch. The effort is ineffectual at best, and it actually brings about a whole new problem as the dredgings from Bubbly Creek are dumped in the lake. In fact, part of what we treasure today as the south end of Grant Park rests on landfill made up with what came from Bubbly Creek. The above photo shows Bubbly Creek around 1915. April 3, 1971 – Roger Henn, the Executive Director of the Union League Club of Chicago, pens a guest editorial for the Chicago Tribune concerning plans for a federal correctional facility at Clark and Van Buren Streets. 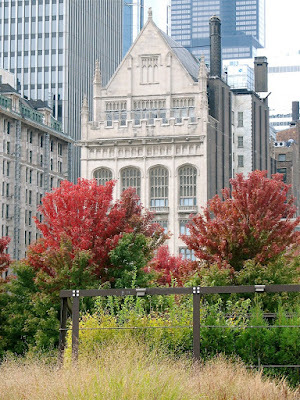 He writes, “Chicago has an almost unbelievable opportunity for development of a great tract of land immediately adjacent to the Loop … Here is an opportunity to build a ‘city within a city’ … Housing of all varieties could be built that would retain the white-collar workers who are now fleeing to the suburbs. 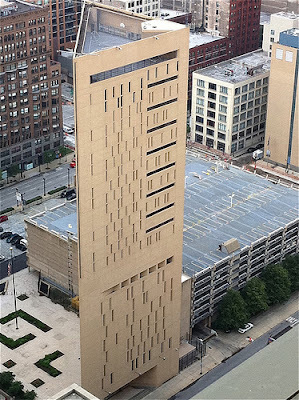 Here, also could be more expensive dwellings for Loop businessmen … Not needed is the proposal of the federal government to place a penal institution and gigantic parking facility squarely on the gateway to this promising area … What is needed is overall planning and cooperation, not spot development for the convenience of the federal government with the resulting loss to all of Chicago.” [Chicago Tribune, April 3,1971] The above photo of Harry Weese’s Metropolitan Correctional Center, completed in 1975, is proof that the federal government ultimately got its way. April 3, 1909 -- The University Club at Michigan and Monroe is opened as 500 members and 700 guests participate in the ceremonies. Members wear academic garb representing their colleges and march in a procession from the old club headquarters on Dearborn to the banquet hall on the ninth floor of the new quarters. There a 75-person glee club joins a 30-piece orchestra and a pipe organ, and "the big dining hall reverberated with the songs of colleges east and west. Latin hymns, drinking songs, chants and serenades were punctuated with yells and cheers." [Chicago Tribune, April 4, 1909] A banquet is served on the eighth floor. 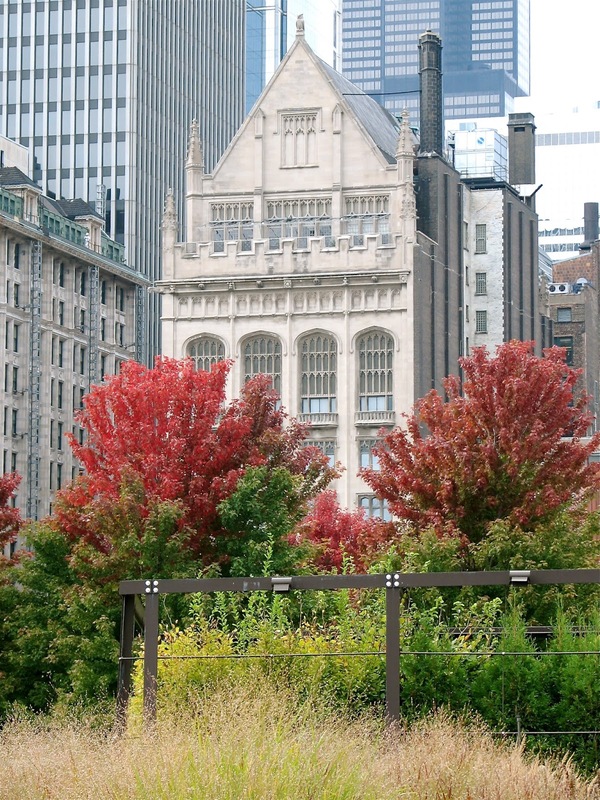 The Holabird and Roche design still occupies its place on Michigan Avenue where University Club members are still active.